Found on the October 1972 issue of Scientific American. The HP 35 was HP’s very first handheld calculator. The HP35A * was introduced in 1st February 1972. It is the first handheld calculator ever to perform logarithmic and trigonometric functions with one keystroke. 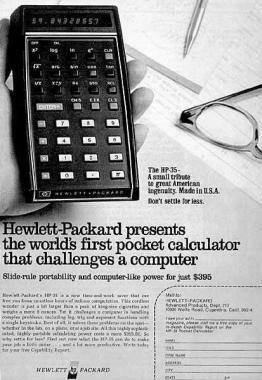 Caption: Hewlett-Packard presents the world’s first pocket calculator that challenges a computer. Slide-rule portability and computer-like power for just $395. The HP35 - A small tribute to great American ingenuity. Made in U.S.A. The HP 35, like all the HP Calculators that followed, was required to remain undamaged after falling three feet onto concrete on each of its corners. and the style of the original HP-35. Tagged By: HP 35 was invented 35 years ago., HP 35. First HP35s were available on a timed monthly payment plan direct from HP largely because of fears it was too costly.